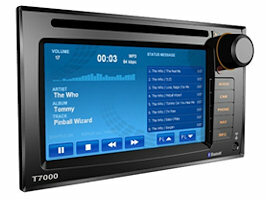 Go Technologies has acquired the current stock and rights to all Eurovox products. We still supply many of the product lines on an ongoing basis. Manufacturing agreements with proven suppliers across Asia and other parts of the world ensures the best quality for all products supplied by Go Technologies. Multimedia Systems – DVD, TV, audio, etc. Vehicle Safety Systems – cameras, sensors, etc. Satellite vehicle tracking solutions for fleets and OEMs. 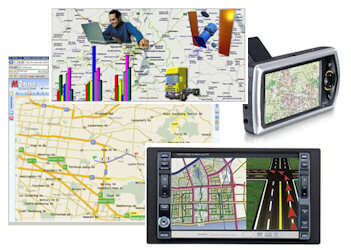 In-vehicle Satellite Navigation systems – new dedicated in-vehicle and portable solutions are currently being developed. Go Technologies has introduced Go Tracking, the next generation of vehicle and asset tracking solutions. The comprehensive range of products enables fleet managers to track their vehicles and assets in real time utilizing the latest developments in GPS, mobile communications and web based software. The GT range of on-board computers comprises a number of in vehicle modules for basic tracking through to comprehensive vehicle and driver monitoring. Temperature, driver compliance and CANBUS integration can also be monitored. The GT range also consists of a self powered OBC for tracking powerless equipment such as trailers or containers or any other mobile assets. The Go Tracking web based software utilises the latest software technologies to enable the vehicle owner or fleet manager to easily and efficiently track their vehicles or assets. A comprehensive reporting suite enables ad-hoc or scheduled reports to be delivered to your Inbox at predetermined times. The MRM (Mobile Resource Module) allows fleet managers to create and schedule routes for drivers and vehicles which can then be delivered to the vehicle. When used with the in vehicle 7 inch touch screen MDT the routes can be displayed on the screen and the vehicle operator can provide feedback to the console on progress during the route. The latest addition to the Go Tracking range of porducts is the Plug & Go Tracking device. This is a very small device which simply plugs in to the vehicles On-Board Diagnostic (OBD) port. Every passnger or light commercial vehicle built since 1994 has an OBD port. This port is used by the service centres to plug in their computer equipment and diagnose any problems with the vehicle. By utilising the OBD port the Plug & Go device can read information directly from the vehicle. The compact size of the Plug & Go device ensures it can be easily installed in any vehicle and easily hidden if required. The image on the left illustrates the compact size of the device. The ease of installation also enables the unit to be moved from vehicle to vehicle very quickly and easily. Internet - The fully featured Go Tracking web software suite enables a feature and graphically rich environment where all tracking information can be veiwed in real time. Reports can be scheduled and received daily, weekly or monhtly in your Inbox in a variety of formats. Download Go Tracking software datasheet. Reports - reports can be generated as required or scheduled to be emailed daily, weekly or monthly in a variety of formats. Smartphone users - there is an app available for iPhone/iPad or Android devices which allows you to see all your favorite vehicles, current locations and trips. As well as reporting on any bad driving behaviour. The ability to enter fuel tickets for expense and FBT reporting and is also another handy feature. Integration - tracking information can be provided as a data feed to the companies back office systems. This allows for tracking data to be used in ERP, MRP or other internal computer systems. To arrange a no obligation free demonstration please contact Go Technologies. These solutions can be tailored to suit all types of vehicles. Cars and most passenger vehicles can benefit from a single camera system. 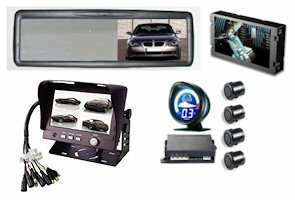 These can be supplied as accessories or integrated with existing in-vehicle screens to provide an OEM type solution. Trucks and vans often require a solution that contains one or more cameras. This can be easily accommodated by installing multiple cameras and a split screen for easy viewing. DVR – Digital Video Recording systems can be easily integrated in to any existing camera system. This gives the owner, operator or fleet manager the ability to review driver habits for safety or compliance issues. Proximity Sensors – systems are available for passenger vehicles and also for heavy vehicles. Displays can be utilized where required to give the driver a visual guide as well as audible alert. Sensors can be located in the rear or the front of a vehicle.